The legendary performance of 588 with the most advanced spin technology and more control. For those seeking a tour proven design, 588 RTX 2.0's progressively varied sole designs make them more versatile than ever. A cavity back design with a sightly larger profile that adds confidence and forgiveness on full, chip and pitch shots. The subtle cavity promotes perimeter weighting for more forgiveness on off-center hits. 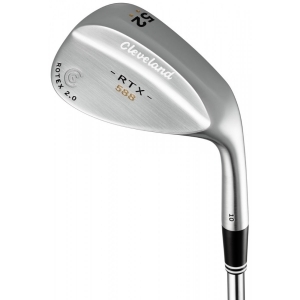 Featuring the fourth generation Tour Zip Grooves combine sharper grooves and deeper micro-milling to provide superior spin on all shots from the rough. The laser milling fine tunes the micro-roughness for more consistency and texture across the face. This allows us to reach the USGA roughness limit, and pushing this boundary lends itself to increased spin on pitch and chip shots. The Rotex face technology literally changed the face of spin in golf last year. Rotex 2.0 takes spin control to yet another level. 15% sharper grooves and a new micro-milled Rotex face pattern give these wedges the most surface roughness the USGA will allow. It's Spin 2.0. The laser milling fine tunes the micro-roughness for more consistency and texture across the face. This allows us to reach the USGA roughness limit, and pushing this boundary lends itself to increased spin on pitch and chip shots.